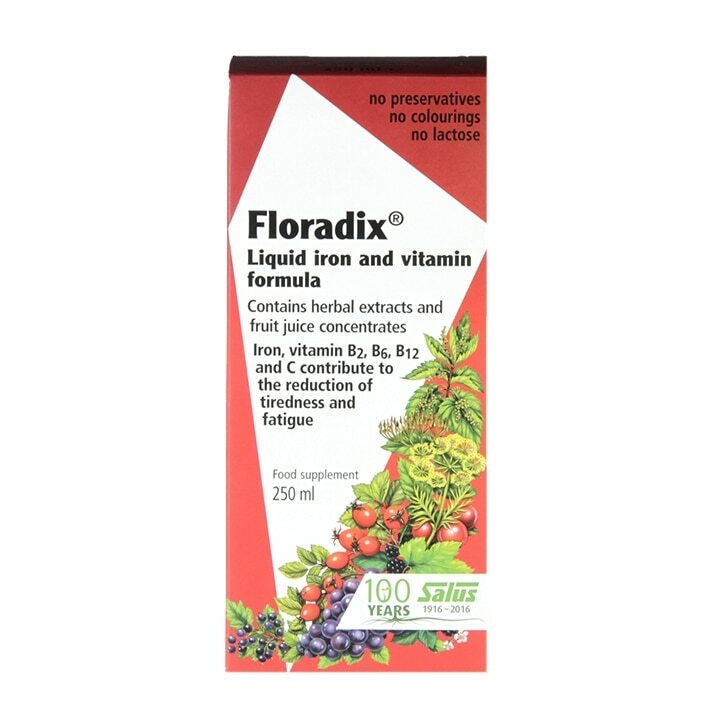 Floradix Liquid Iron Formula contains iron (in the form of iron gluconate), vitamins B2, B6, B12 and C, which contribute to the reduction of tiredness and to normal energy yielding metabolism. Iron also contributes to normal red blood cell and haemoglobin formation, which is supported by vitamins B6 and B12. Floradix also contains vitamin C, which increases iron absorption. As these nutrients are already dissolved in the liquid, they're absorbed more quickly by the digestive system compared to tablets. Floradix is particularly beneficial for people with an active lifestyle, and expectant and lactating mothers. Adults: Take 10ml twice a day. Approximately 30 minutes before morning and evening meals. Children 3 - 5 years: Take 5ml once daily. Children 6 - 12 years: Take 10ml once daily. Aqueous herbal extract (54 %) from: carrot root (Daucus carota),nettle leaf (Urtica dioica),spinach leaf (Spinacia oleracea),couch grass root (Agropyron repens),fennel fruit (Foeniculum vulgare),kelp thallus (Macrocystis pyrifera), roselle flower (Hibiscus sabdariffa).Mixture of fruit juice concentrates (29.4 %) of: pear, grape, blackcurrant juice, water, blackberry, cherry, orange,red beet,lemon,carob extract,apple.Aqueous yeast extract,honey,aqueous rosehip softextract (Rosa canina) containing 4 % vitamin C, iron (as ferrous gluconate), wheat germ extract, vitamin C ascorbic acid), natural flavours, thiamine (as thiamin hydrochloride), riboflavin (as riboflavin sodium phosphate), vitamin B6 (as pyridoxine hydrochloride), vitamin B12 (cyanocobalamine). Shake bottle before use. Take 10 ml twice a day. Approx 30 minutes before morning and evening meals Children 3 - 5 years 5ml taken once daily Children 6 - 12 years 10ml taken once daily. Floradix Liquid Iron Formula is rated 4.8 out of 5 by 73. Rated 5 out of 5 by Momma D from All good Products as advertised and delivered on time. All good.